Konica Minolta, a leading supplier of cutting-edge print and network technologies, presents a full color printer magicolor 7450 II GA designed for work in creative workgroups. Advertisement agencies, design and art studios can now easily implement their ideas with wide range of graphical capabilities of this printer. The printing system is based on the well-known magicolor 7450, a printer with numerous international awards. 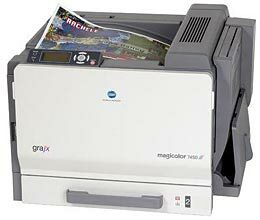 The new magicolor 7450 II GA features high printing speed (25 pages per minute), standard memory (768 Mb) and maximum monthly duty cycle (up to 120 000 impressions). The Magicolor 7450 II GA can optionally be equipped with a hard drive of 40 Gb. With a full set of printing scenarios, magicolor 7450 II GA provides image and document printing in various formats and modes. Flat color print technology guarantees a photorealistic details and soft color gradients at high speed of printing, thus proving a high level of printing that meets expectations of professional designers. The performance and the speed of the machine allow small workgroups to cut the cost of a impression without compromising the quality. The printer supports paper media of various densities (64 to 256 g/sq. m.) and formats (A6 to A3++). The multipurpose 250-sheet paper tray and 100-sheet manual feed tray can be used to feed thick paper, stickers and many other media. The standard 350-sheet input paper tray is expandable to 1,850-sheet capacity with optional additional trays. And installing a duplex unit allows double-sided and booklet printing on up to 256 g/sq. m. media. Just like any other Konica Minolta printers equipped with Emperon print controller, magicolor 7450 II GA features a complex, yet easy to use PageScope printing tools control panel that facilitates print setup and printer management. Besides, magicolor 7450 II GA incorporates PhotoART-9600™ Technology that guarantees excellent images and vibrant colors. The Konica Minolta’s smart graduation system, Automatic Image Density Control, provides color homogeneity of every printout. The magicolor 7450 II GA uses an exclusive Konica Minolta’s technology, the Simitri color polymer toner. This toner enables accurate reproduction of image detail, halftones and color, and enhances the quality of printouts, making them more vivid, sharp and smudge-resistant. An ICC-based color matching system provides an automatic color control. Magicolor 7450 II GA supports direct print from a digital camera using PictBridge. This entry was posted on Monday, March 9th, 2009 at 4:19 am	and is filed under Konica Minolta, printer. "There Is Something About Samsung SCX-4725FN"
"Xerox Ranked No. 1 In Computer Industry"